This entry was posted on January 30, 2015 by Chrissy Roos. There's many ways to ask someone to prom (called a promposal!) - you can keep it simple and go with a straightforward invitation, or you can get as creative as your mind lets you! Whether you're a girl asking the guy to prom, or waiting for the guy to ask you, it's always fun to find a creative, unique way to do it. After all, it's a special night and one you'll never forget, so there's nothing wrong with making the invitation special, too! 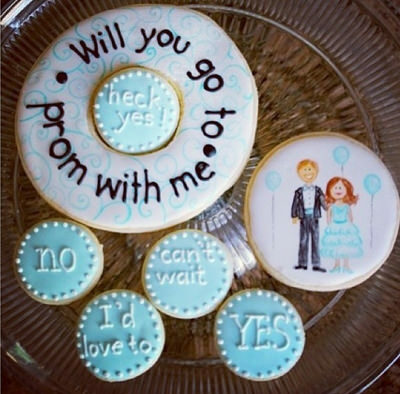 We've been especially loving searching Pinterest for all of the cute ways people are being asked to prom. Below are some of our favorites - we hope they give you some great ideas of your own! If you want to keep your promposal simple, there's still plenty of creative ways that you can ask the question. 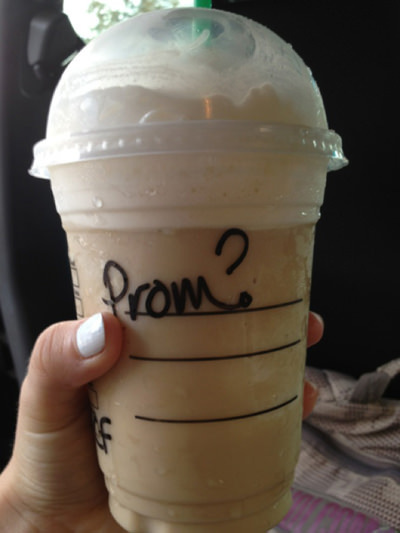 We love the idea of getting a Starbucks barista to write "Prom?" on a specially made drink for your sweetheart. It's so simple, but will be sure to take your date by surprise and put a big smile on his or her face. The icing on the cake to asking your date with this method is to make sure you order his or her favorite drink. 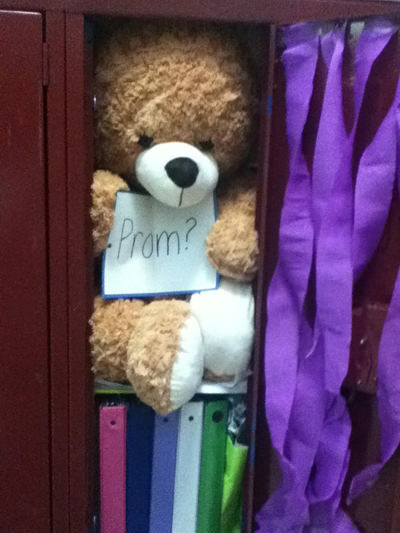 Another simple and cute way to ask someone to prom is with a teddy bear, of course! Because, who doesn't love teddy bears? A cute thing to do to add a personal touch could be to spray the bear with your perfume or cologne; this way, the bear will smell like you. Looking for a romantic way to ask someone to prom? 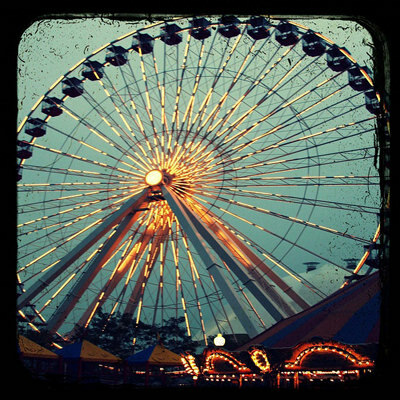 We love the idea of asking on a ferris wheel - it will feel like the movies! Another super romantic way to get asked to prom is with lots and lots of roses, of course! We love this photo of a boyfriend asking his girlfriend to prom by spelling out "Prom?" on her bed with rose pedals. For a super sweet promposal, you can't go wrong with...sweets! Find a unique and fun way to pop the question with cookies, cupcakes, or chocolate, and you'll be sure to have a sweet, sweet evening. 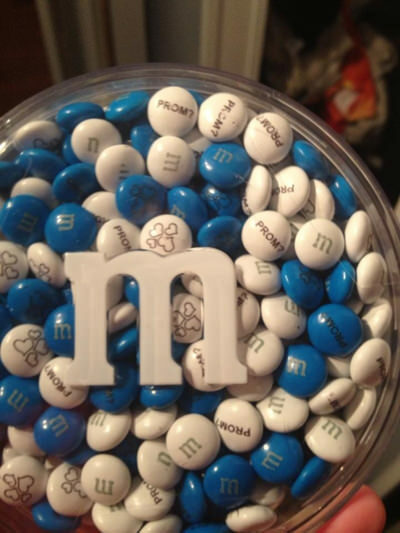 We love the idea of getting custom M&M's that say "Prom?" on them! It really shows that the person put a lot of time and effort into the idea. After all, they have to be specially ordered from M&M's. Finding a funny way to ask your date to prom can help to lighten to mood for something that can seem serious and a little scary. 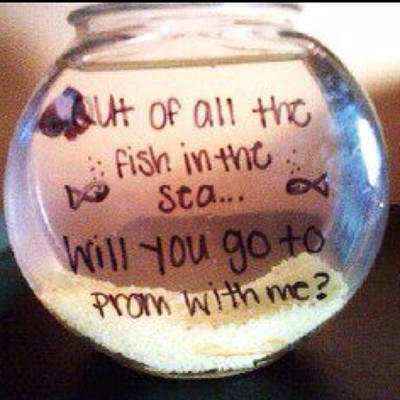 Coming up with a cute slogan like, "Out of all the fish in the sea, will you go to prom with me?" will lighten the mood in an instant and have you both giving a good chuckle. And of course, how could you say "no" to a new little fishy friend? Just make sure to take care of it. When we say cheesy, we mean cheesy! We thought this idea was just too cute, and for sure gave us a good laugh. It's definitely a fun...and delicious...way to ask your date to prom. If you're a girl looking for cute ways to ask a guy to prom, they always say the best way to a man's heart through his stomach. If you are in a relationship with the person you want to ask to prom, it's always a good choice to find a more meaningful way to ask the question. Since you are in a committed relationship with the person, you already know that you can expect a resounding "yes" to your promposal, so you can really pull out all the stops without being afraid! Especially for the seniors, this is probably your last big event of the year with your significant other, so make it special. The Disney movie "UP" is both a sad and happy movie about a widower, so we loved seeing how a boyfriend found a creative way to incorporate the movie into his promposal. 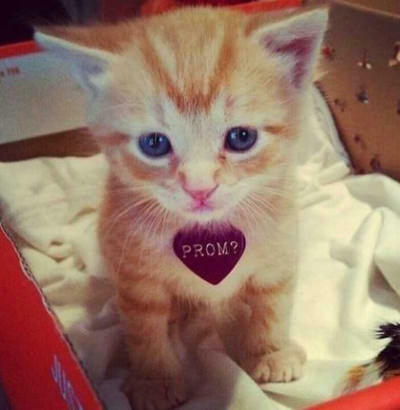 It hands down doesn't get much cuter than asking someone to prom with a kitty! But, we put this in the "Personal and Meaningful" section because this is not something you want to do without knowing that the person you are giving the cat to can take care of the animal. You should talk to your date and his or her family ahead of time to make sure that they are ready, willing, and able to take care of the kitty as their new family pet. Were you asked to prom already? 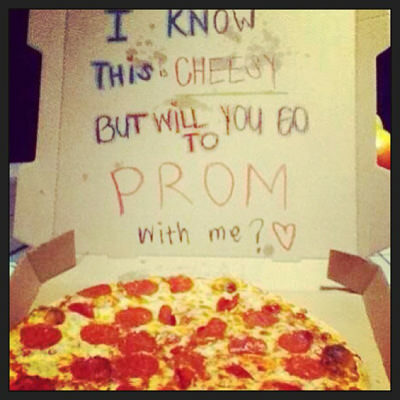 Are you planning to ask someone to prom soon? Leave us a comment below and let us know about it. They should help you come up with a whole slew of ideas. Just pick an idea that you feel comfortable doing... and that you know will put a smile on your girlfriend's face! However you choose to ask her, we're sure it will be a very memorable and special moment for the both of you. Let us know what you decide to do, and take a lot of pictures (or a video)! We'd LOVE to see them and feature them on our website! Feel free to email us at social@rissyroos.com if you do take pictures/a video! My senior year, my date asked me by putting a kite on the windshield of my car which he had covered with paper and wrote "I couldn't fly this without you...so will you go to PROM with me?" It was super cute! And my junior year my date knew that I loved constellations so he wrote out PROM? In those glow in the dark stars on a black poster and hung it up. Awww, both ideas are so cute! Did you take any pictures? We'd love to add them to the post! else ould anybody get that type oof info in such an ideal manner of writing? Hello would you mind letting me know whifh webhost you're using? I must ssay this blog loads a lot ffaster then most. Can you recommend a good hosting provider at a hoest price?